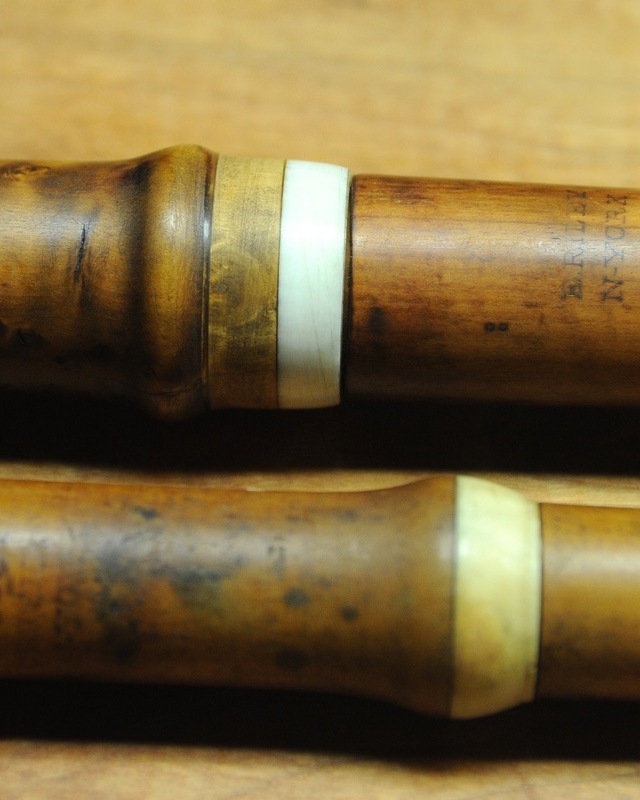 Maker: Riley / 29 Chatham St/ N. York active (1819-1829) Like many flute makers Edward Riley was active in many areas. He was also a music publisher, music engraver, teacher, singer, and dealer. This flute would have been made by his sons in 1842. Following his death in 1829 his sons carried one the business until it became J.F. Gould & Co. in 1851. He wrote a treatise on flute playing and a four-volume collection on music entitled “Riley’s Flute Melodies.” His two daughters married John Firth and William Hall, respectively. Notes: These are clearly made as band instruments rather than as concert flutes. They are both functional but not so interesting as performing instruments. There is strange repair (old?) to the head joint of the F flute but is limited to the tenon socket.